This program will give you valuable training, insight, and support to establish yourself as a trusted travel advisor in the burgeoning wellness travel industry. Upon registration, you will gain instant access to insider knowledge that will help differentiate yourself from your competition. 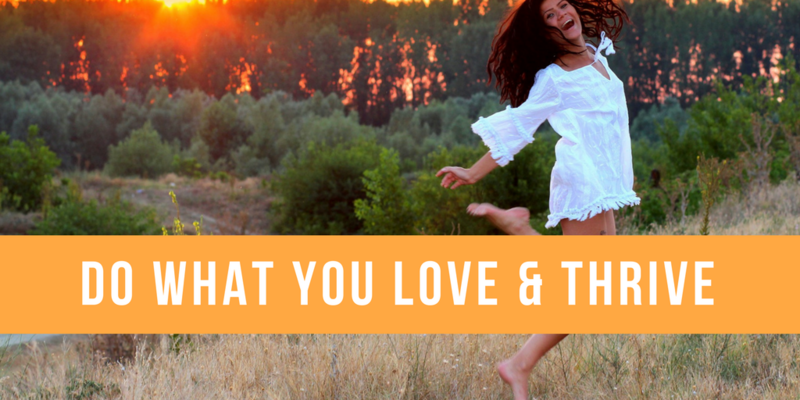 Did you know that wellness travelers stay longer, spend a healthy amount of money to achieve their goals, return home happy clients and share their positive experiences with others? Wellness-minded travelers are interested in being their best self and in building a better world....and they often repeat customers too! Our training will elevate your confidence and credibility in developing your own unique wellness travel business. Amplify your knowledge and further your skill sets to optimize your success. Gain valuable ah-ha moments to propel you forward and thrive in this growing niche. Ask your most pressing questions (from anywhere in the world!) and have them answered. Highly Curated Recommended Reading List so you don't have to hunt & peck for information. You Also Receive These Bonuses! BONUS: Ask Away! Have your most pressing questions answered in a private platform! (Like having your own wellness travel consultant on-hand with no additional cost to you! WOW! BONUS: Unlimited access for 12 months! 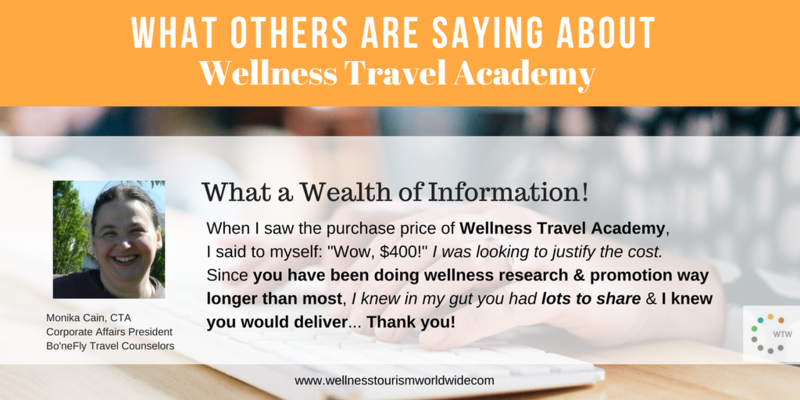 Why Choose Wellness Travel Academy? 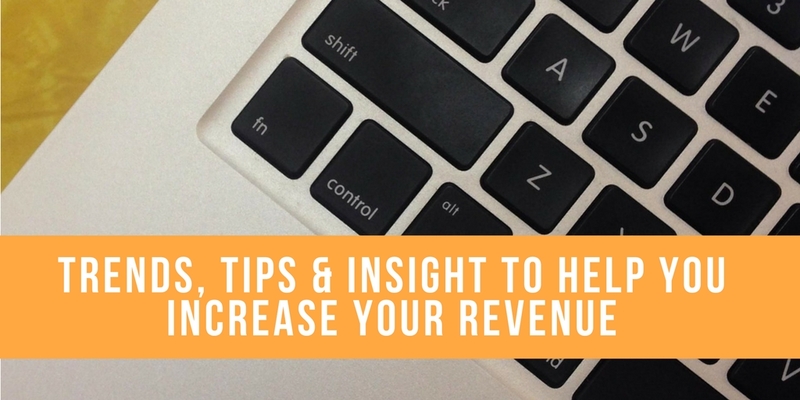 Practical information that you can apply to your business immediately! A clear lesson plan complete with learning exercises and recommended reading. A course created with the input of hundreds of surveyed travel agents. Proprietary data only available through Wellness Travel Academy. Upon the completion of this course, you will be able to differentiate yourself and create a strong position for the future. If you’ve taken a spa travel, medical tourism or other travel agent certification that left you wanting a course exclusively focused on wellness travel, Wellness Travel Academy is for you! A wealth of information. The course is very well laid out & easy to follow. I loved all of the added content! This is a spectacular course. I recommend this course to anyone that is seeking some understanding in the wellness industry. The website is user friendly, has an abundance of necessary information, and the course is motivational. There are helpful videos, graphs and other resources that assist me throughout the coursework of this training. Upon taking this course, I feel that I can sell wellness travel more efficiently and comfortable. With the information from this course, I'm confident my clients will make a wellness lifestyle change that includes travel. This course was very user friendly and extremely informative. Camille explains Wellness Travel in such detail, and is always available to answer any questions. She has really influenced my decision to focus on this niche. I knew Americans were overworked, but I was amazed at the statistics on the number of vacation days that go unused. I'm excited to begin educating my clients on the benefits of taking them all, and matching their interests with the best destination and type of wellness vacation. 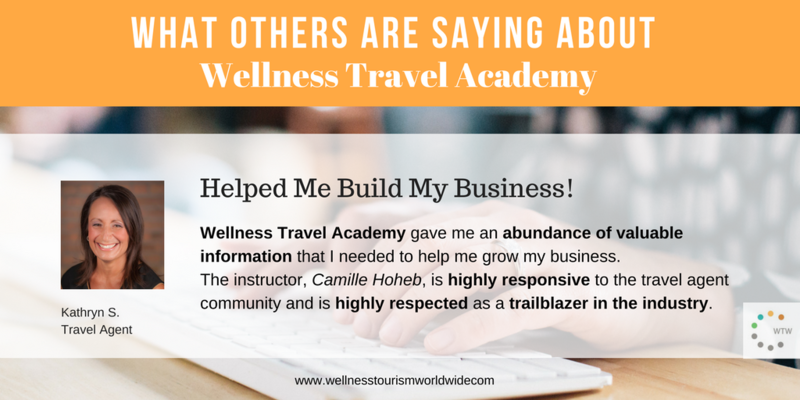 I am so glad I found The Wellness Travel Academy! Camille Hoheb is a recognized authority in wellness travel and speaks all over the world promoting work/life balance, the importance of vacations and quality of life. As the President of Wellness Tourism Worldwide. Camille has received 10 awards for tourism marketing excellence, was recognized as an "Outstanding Mentor in Travel and Tourism" and was recognized as a "Trendsetter" by TravelAge West Magazine. Her expertise is featured in Forbes.com, Huffington Post, Travel Market Report, Successful Meeting, Delta Sky & and Travel Weekly among others. She is often invited by tourism boards, associations and conferences to speak on wellness tourism.